Hi, Bhavana here!! This month our collaborating partner is Pretty Pink Posh. Thank you Paulina for the wonderful dies and sequins you sent to us. For the first card I used the second layer of stamp from Hero arts Hibiscus layering stamp set and stamped all over to create the background also stamped the center piece too. 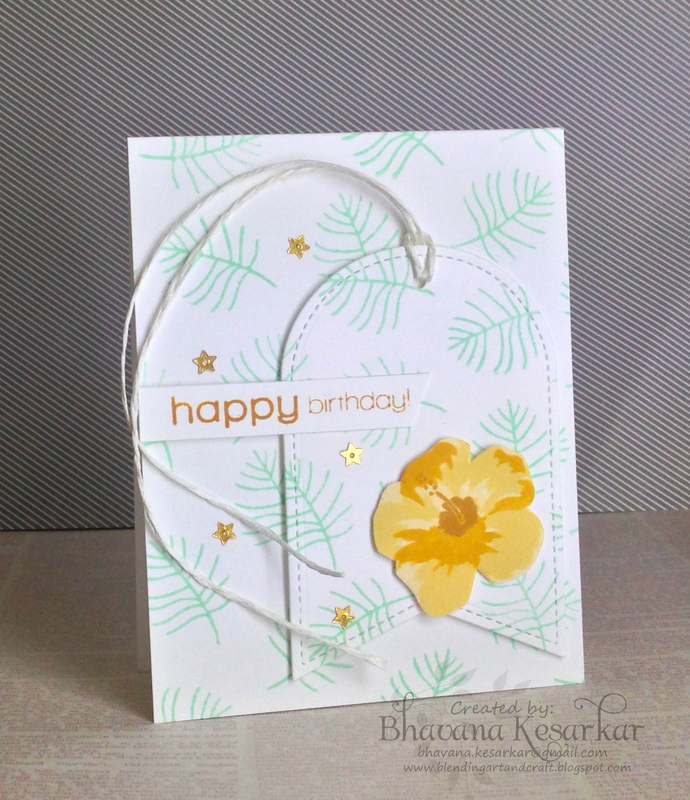 Stamped the complete flower on a white cardstock and hand cut it. Arranged the banner, flower and the sentiment strip together and added pretty pink posh sparkling clear sequins. 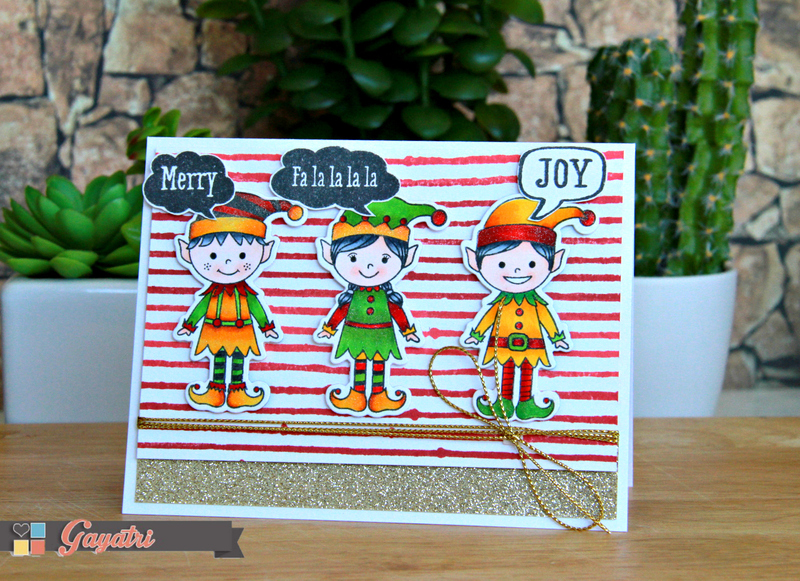 For the second card I stamped the second layer of the leaves and used pretty pink posh gold star sequins. Hope you all enjoyed the beautiful cards shared by our design team using Pretty pink posh products and see you soon with the new challenge this month till then Happy crafting!! Hi, Bhavana here! 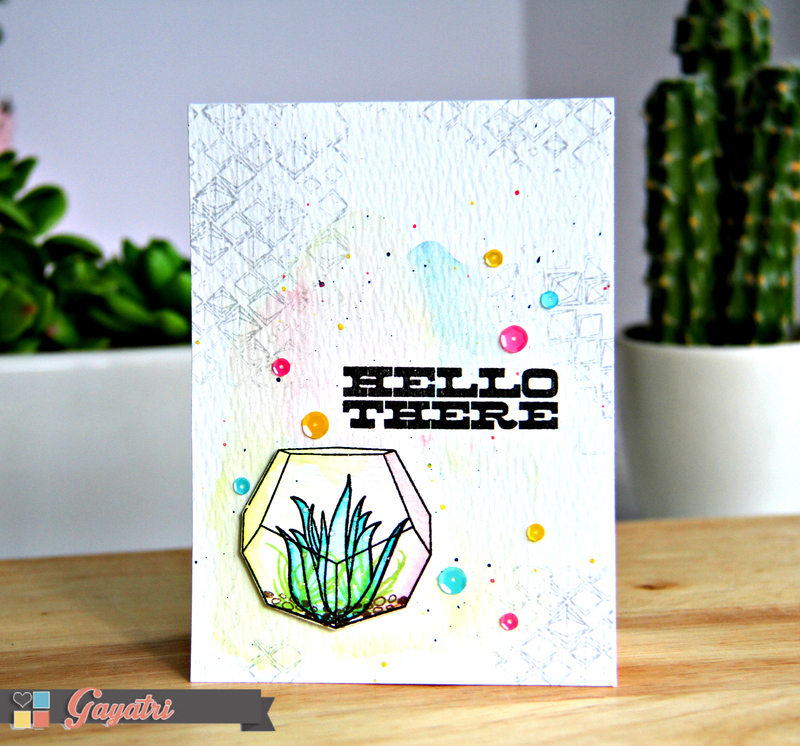 This month we are collaborating with Neat and Tangled and today I have card using Neat and Tangles Tiny triangles die and Hero Arts Layering hibiscus stamp set. 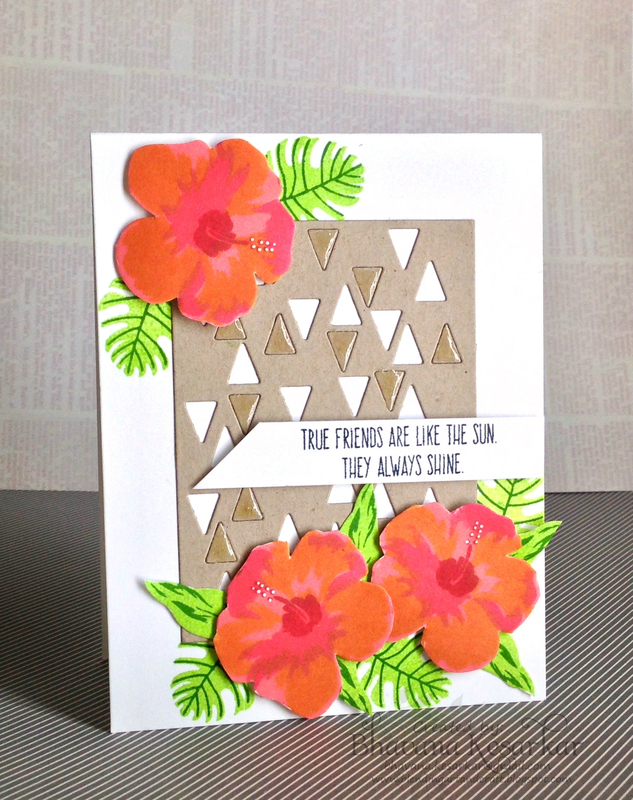 I first diecut the desert storm cardstock using tiny triangles die. Stamped the flowers on white cardstock using Hero Arts fresh peach, pale tomato and simon says stamp orange peel, lipstick red inks For the leaves I used Hero arts green hill and jenni bowlin seed packet inks. I hand cut the flowers and arranged stuck the flowers using the foam tape. Also glued back the die cut teeny tiny triangles and added a glossy accents over it. For the sentiment I used Neat and Tangles Scandinavian flower stamp set. 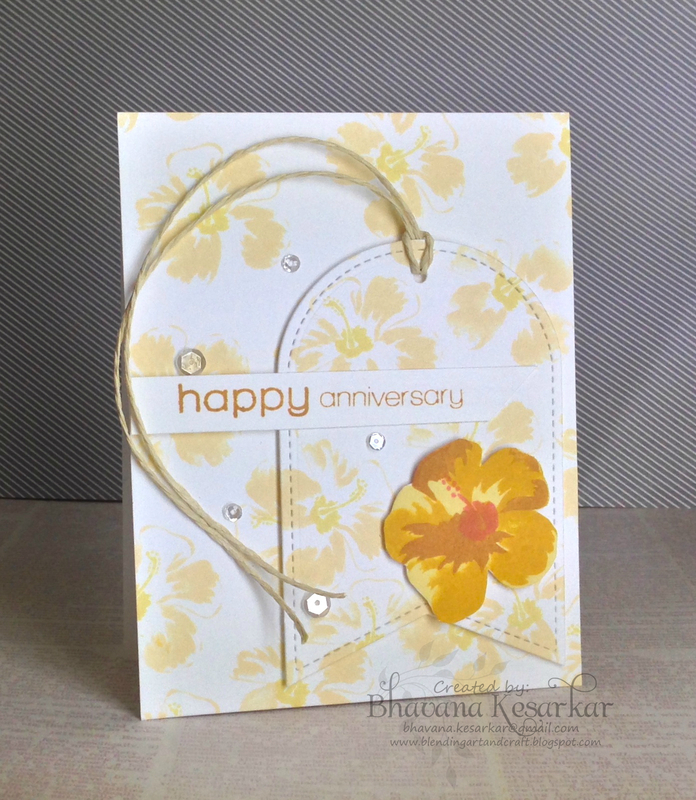 Stamped the sentiment on white cardstock strip and used foam tape to added it on the front of the card. To complete my card I added a few white dots on the flowers using a white gel pen. Hello there! This is Gayatri with you today. Tic Tac Toe is an awesome challenge to play because it gives you so many combinations to play with. I chose the first column on the left – circles, background stamp and watercolour. Here is my card using the three combination. So I started with watercolour cardstock. I have done some very subtle watercolour wash in blue, pink and yellow watercolour. I used Gansai Tambi watercolour palette here. Now back to the watercolour panel. It is now dry. So I stamped the Diamond Hero Arts/Studio Calico background stamp using Soft Granite Shadow ink randomly to add subtle texture to the background. 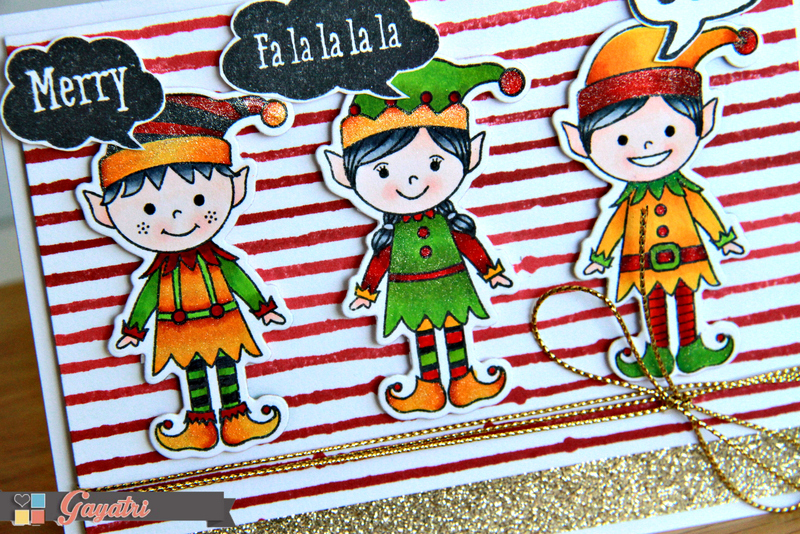 Here the background stamped is used in a non traditional way instead of the traditionally stamping the entire background. I then stamped the sentiment from Hey Day Sentiment stamp set one of my favourite sentiment stamp set in black. I love the bold black sentiments. The terrarium is adhered to the panel using foam adhesives for some dimension. 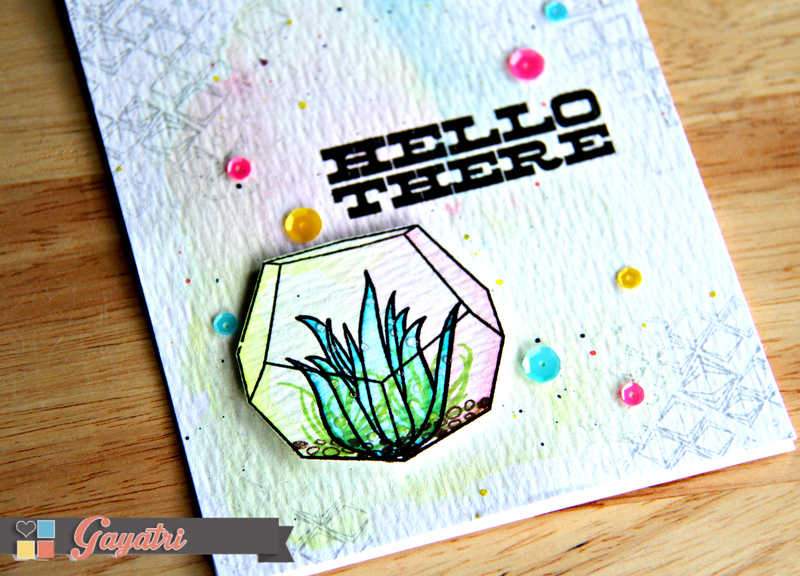 Finally, I accented the colours from the background and the terrarium with some gorgeous sequins from Pretty Pink Posh. Again I have gone for some unconventional way of using circles on my card. Yes, the sequins are the circles 😉 I have adhered the completed panel to the card base. Yeah! Thats it! This is my take on the Hero Arts Tic Tac Toe challenge. Here is closeup of the card.